Why choose Pro.Clinics for a non-surgical facelift cryotherapy facial (Frotox) treatment? In today’s social media obsessed world, people are becoming more and more conscious of the way that they look, and are always searching for new and effective ways to enhance their appearance. Pro. Clinics are experts in the field of non surgical aesthetic treatments, and offer a range of procedures that are designed to smooth, tighten and lift the skin. Cryo. facial treatments are rapidly gaining in popularity, due to the relatively low cost of the treatment, the lack of down-time, as well as the incredible and instant results! More and more people are turning away from major surgery and injectablels in favor of non-surgical solutions. It’s hardly surprising that many celebrities are now turning to to the power of cryotherapy in order to roll back the years! The treatment involves the use of very cold gas that is spayed under high pressure directly onto the face. The treatment is very quick, and a full treatment takes just 15 minutes. The treatment is not painful, and there is no down-time involved. The only down-side is that the treatment is highly addictive and once people have experienced the power of ‘Frotox’ they are often hooked! What is a non-surgical face lift / Cryotherapy Facial (Frotox) Treatment? The cryotherapy facial treatment or Frotox, as it is often called, is a non-invasive and pain-free non-surgical face lift. During a Frotox session, the skin is rapidly cooled, using a high powered jet of vaporized liquid nitrogen, to well below freezing in a matter of minutes using a handheld cryo-stimulation device. This process leads to an instant tightening of the microcirculation blood stream, known as vasoconstriction and then dilation of the blood vessels and capillaries, which helps to flush multiple toxins and impurities away from the skin. The process helps to contract the skin and accelerate microcirculation, which leads to better oxygenation of dermal cells, encourages collagen production and helps to detox and rejuvenate the skin. The treatment is very quick and most people are in and out within 30 minutes. The results are immediate and very noticeable. Another major advantage to this treatment is there is generally no downtime or adverse side effects. What are the different options for people who are considering a non-surgical face lift? Creams, CACI, HIFU, laser etc? There are many different types of non-surgical facelifts available to choose from if you are not willing to undergo full surgery, but still feel that you would like to rejuvenate your skin. Anti-wrinkle Creams – Using anti-wrinkle creams may be a slow and often gradual process, but the results are often pretty successful. For middle-aged people, who are conscious about their skin, the regular use of anti-wrinkle creams often helps to maintain the tone and achieve a rejuvenated look. Fillers and Botox – The use of injectables is one of the most popular and enduring types of non-surgical facelift. This method uses injectable specialist fluids which help to remove deep wrinkles and tightens the skin. Thread lift – Another option, although a slightly more invasive one, is a thread lift. This is a non-surgical facelift procedure and usually takes a couple of hours to perform. During the process, thin threads are inserted into a specific area on the skin by making tiny cuts into it. The threads are then pulled tight which results in an instant tightening and lifting of the skin. This method is expensive and has a significant down time, although the results can be seen almost immediately and are very noticeable. Radio Frequency – Handheld radio frequency massage devices are available that are used to massage your skin and at the same time, tighten it. Using devices with radiofrequency is another tried and tested option of achieving a non-surgical facelift. 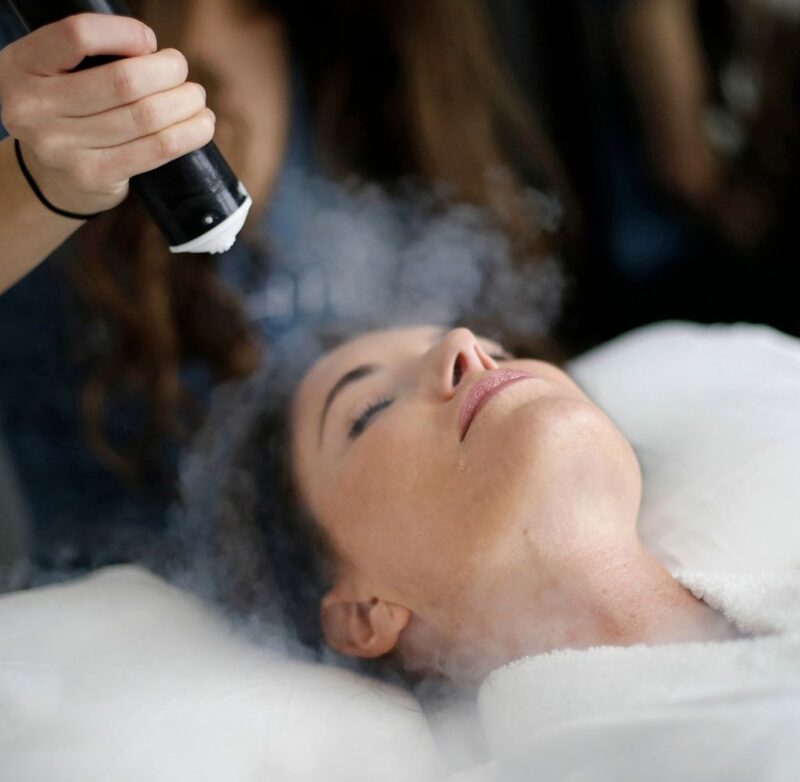 Today, numerous celebrities such as Demi Moore, Kim Kardashian, Lindsay Lohan and Danielle Craig to name just a few, regularly use Cryotherapy Facial (Frotox) treatments as a health as an alternative to a surgical face lift. It’s a highly effective treatment, as the cold vapor causes the blood vessels to contract and then dilate, which improves the oxygen and nutrient supply to the skin’s surface, making it appear tighter, smoother and more radiant. It is a tried and tested method of rejuvenating and tightening the skin and is considered a very low risk procedure. What are the benefits of Frotox? There are many benefits to the cryotherapy facial treatment. The application ultra cold temperature to the surface of the face causes the pores to close, and the surface temperature of the skin drops to around minus 9 Celsius. In order for the skin to return to the correct temperature, a huge amount of blood and oxygen rushes to the face, with much more oxygen than normal reaching the surface of the face. When this happens, it triggers a greatly increased production of collagen, resulting in smoother, tighter, more even skin tone, as well as reducing the visible signs of aging. It will also improve the appearance of scars and fine wrinkles. The intense cold vapor activates collagen production in the deeper layers of the skin, leaving your skin fresh, firm and tight. What is the cost of Frotox? As with all of our treatments at Pro Clinics, we work hard to keep our costs to a minimum and as affordable as possible. We aim to help everyone achieve a younger fresher look, not just the elite few! We charge just £50 per session for our Frotox treatments, and when compared to the cost of Botox or Fillers is remarkably good value. We also offer discounts for individuals wishing to book multiple sessions. Our cryotherapy facial treatment is a very quick and easy procedure that offers highly noticeable results in just a few short minutes. Firstly the skin will be cleansed with a skin cleaning product to ensure that the it is free of any impurities or makeup etc. The clinician will then begin the process of chilling your face and neck, using our specialist handheld cryo device. The first stage lasts for around thirty seconds on each side of the face. Once this stage has been completed, the skin will immediately appear refreshed and tighter. The next stage is the stage that we like to describe as the ‘ironing’ or ‘smoothing’ stage. This involves cooling a small dome deice to sub zero temperatures, and rubbing it firmly over any lines, creases or wrinkles that are present. This results in an instant smoothing of the skin. The next step is freezing the face again, this time with a very powerful targeted jet of compressed CO2. Again for thirty seconds each side of the face. The final process is to apply a thin application of Bio oil which gives the skin a beautiful healthy, smooth sheen. Most people can see an instant improvement after just one 15 minute treatment. Saying that, we often find that our clients are so pleased with the results that they decide to book further treatments in order to achieve more dramatic results. We consider six treatments as a full course, and have found that the best results are achieved if a client has one session per week for six weeks. Many people also like to book a treatment just before a big event, such as a wedding or important social function, to ensure that they are looking their best for the big day. The effects of our cryo facial treatment are generally long lasting, with visible results often still apparent for several months following the treatment. It goes without saying that the more treatments an individual has, the longer lasting and more noticeable the results become. Many clients also like to book top up sessions on a monthly basis to insure that their skin is looking as good as possible. The cryotherapy facial treatment is considered to be a very safe and effective method of achieving a non surgical face lift. There are very few risks associated with the procedure and it is generally suitable for most clients. There is no specific aftercare protocol required following a cryo facial treatment. Once the procedure has been completed you are free to resume everyday activities and there is no down time associated with the treatment.